Edison, the Man is a 1940 biographical film depicting the life of inventor Thomas Edison, who was played by Spencer Tracy. Hugo Butler and Dore Schary were nominated for the Academy Award for Best Writing, Original Story for their work on this film. However, much of the film's script fictionalizes or exaggerates the real events of Edison's life. The film was the second of a complementary pair of Edison biopics released a short time apart by MGM. Young Tom Edison starring Mickey Rooney was released first and told the story of Edison's youth. In 1869, anxious to be more than a tramp telegraph operator, Edison (Spencer Tracy) travels to New York at the prompting of an old friend, Bunt Cavatt (Lynne Overman). He goes to work for Mr. Els (Henry Travers). He tries to persuade financier Mr. Taggart (Gene Lockhart) to fund the development of his inventions, but Taggart has no interest in financing “green electrical workers”. However, General Powell (Charles Coburn), the president of Western Union, does. Edison eventually sells an invention to Taggart and Powell for $40,000, enabling him to get married and open his own “invention factory” at Menlo Park. In the next few years, he perfects the phonograph with his devoted staff. Trouble arises when Bunt brags to reporters that Edison has invented the electric light. Since he hasn't yet, he is condemned by the scientific community (encouraged by Taggart, whose gas stocks are threatened by the announcement). Edison “leaves science behind”, and with a Herculean trial-and-error effort, finally succeeds in inventing a practical electric light. His subsequent plans to light New York are again hindered by Taggart, who arranges it so that Edison is only given six months to complete the entire task. Nevertheless, Edison finishes the job just in time. Bosley Crowther of The New York Times praised Tracy's performance for bringing "human and vital substantiality" to the role, but criticized the film for its historical inaccuracies: "When Metro deliberately distorts certain important details in Edison's career and boldly invents others—even though it were done with the sanction of his family—the question arises as to whether this creation is intended to be a reliable portrait of the great inventor or just another fellow who looks something like him. Frankly, we think it wiser to regard it in the second light." Variety called the film "a top-bracket picture from Metro that takes its place among the more important biographical contributions by the screen." Harrison's Reports wrote: "As in Young Tom Edison, this offers good entertainment for both young and old, in spite of the fact that the action is not particularly fast-moving. In a way it is even better than the first picture, for the older Edison is more interesting, and the work he accomplishes is far more exciting." Film Daily called it "one of the truly memorable pictures of the year" and predicted it would "command most serious consideration" when it came time to vote for the Academy Awards. John Mosher of The New Yorker wrote that even though the story of Edison's career was "not really screen material ... more than one might think, its interest mounts with the advance of the picture and some actual excitement is achieved at last." According to MGM records the film earned $1,152,000 in the US and Canada and $635,000 elsewhere resulting in a profit of $143,000. ↑ "Young Tom Edison (1940)". Turner Classic Movies. Retrieved November 27, 2015. ↑ Crowther, Bosley (June 7, 1940). 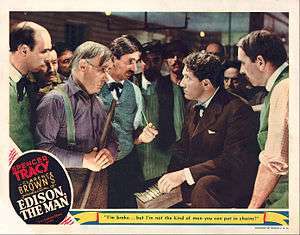 "Movie Review - Edison the Man". The New York Times. Retrieved November 27, 2015. ↑ "Edison, the Man". Variety. New York: Variety, Inc. May 22, 1940. p. 14. 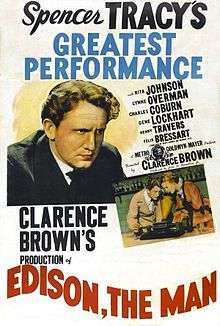 ↑ "'Edison the Man' with Spencer Tracy and Rita Johnson". Harrison's Reports: 83. May 25, 1940. ↑ "Reviews". Film Daily. New York: Wid's Films and Film Folk, Inc.: 8 May 17, 1940. ↑ Mosher, John (June 1, 1940). "The Current Cinema". The New Yorker. New York: F-R Publishing Corp. p. 79.